The delicate, bright yellow flowers that squash produce before developing into the full vegetable are not only gorgeous to look at, but also edibly fabulous when filled with cheese. I procured some fresh squash blossoms this weekend from the renowned Chino Farm, filled them with goat cheese, herbs, shallots and garlic, tempura-fried them and nestled them onto sourdough bread with a sprinkling of some stretchy mozzarella. Squash Blossom Grilled Cheese was outrageously good. Squash blossoms are just starting to emerge in the farmers markets around here, it’s still a little early in the season. My husband and I finally tried them for the first time at a restaurant about a month ago – I’ve been dreaming about how I could translate them into grilled cheese ever since. The squash blossom grilled cheese concept is actually not too big of a leap. Squash blossoms are quite often stuffed with goat cheese or ricotta as appetizers (the tempura squash blossom appetizers I used for this sandwich, pictured above, are light as can be with huge fresh herb flavor). And, as I’ve been reading, squash blossom quesadillas are especially popular in Oaxaca, Mexico. You can taste absolutely everything that goes into this sandwich. 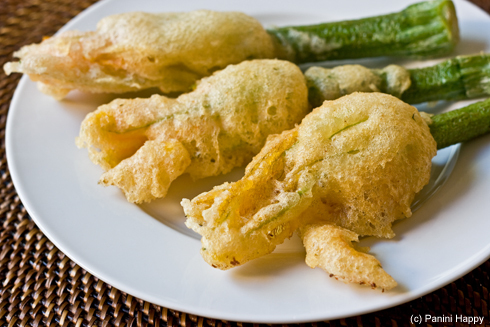 The squash blossom, which is fried for just one minute, retains its gentle texture as well as the crunch of the tempura. The herbed goat cheese flavors remind me a bit of my Green Goddess Grilled Cheese, minus the lemon or anchovies. I added just a little bit of stretchy mozzarella cheese to bring it all together in the sandwich and brushed olive oil on the bread to make it extra crispy. There’s a bit of prep involved with this one, but wow, it’s worth it! Adapted from the Tempura Squash Blossoms with Herbed Goat Cheese recipe on the Earthbound Farm website. Heat the 1 tablespoon of olive oil in a small skillet over low heat. Add the shallots and garlic, and cook until the moisture has mostly evaporated and the onions have just begun to caramelize. Cool mixture to room temperature. Place the herbs and goat cheese in the bowl of a mixer (or a mini-prep food processor, as I did) and blend at low speed until the herbs are evenly distributed. Add the shallot-garlic mixture and blend again. Taste and adjust seasoning as desired. Carefully rinse each squash blossom thoroughly and pat dry. Transfer herbed cheese to a plastic ziploc bag, cut off one corner, and pipe some of the herbed cheese into each blossom. Set aside. 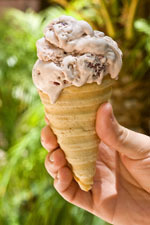 Combine the cornstarch and 1/2 cup of soda water in a small bowl and whisk to blend. Set aside. Whisk together the flour, baking powder, and cayenne pepper. Add the remaining cup of soda water and stir to blend. Whisk in the cornstarch mixture. 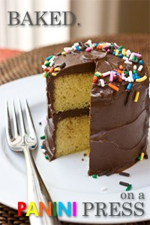 Cover the bowl with plastic wrap and set aside for 10 minutes. Fill a deep frying pan or pot with 2 inches of canola oil and heat to 350°F over medium-high heat. Dip each blossom into the tempura batter. Transfer gently to the hot oil and cook until golden brown, about 1 minute. Transfer blossoms to paper towels to absorb excess oil. Season with salt and pepper, to taste. 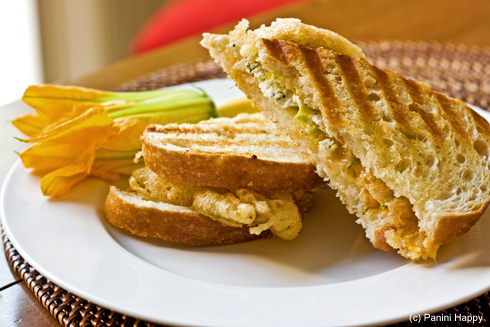 For each sandwich: Sprinkle a small amount of mozzarella cheese onto a slice of bread. Add two tempura squash blossoms. Sprinkle with more mozzarella and close the sandwich with a second slice of bread. Brush olive oil on top and grill for 3 to 5 minutes until the mozzarella is melted and the bread is toasted. This has got to be the most creative grilled cheese sandwich I’ve ever seen! Awesome idea and perfect execution :). Ingenious recipe Kathy! And to think, yesterday was National Grilled Cheese Day! I’m saving this for sure! (there’s always next year:) I’m sure the prep work is worth every single bite. Louise´s last blog post ..Happy Birthday David Letterman!!! I have been wanting to try squash blossoms for a while and this grilled sounds like a great idea! Now why have I never thought of doing that? That is a brillant use of squash blossoms. Now this is a grilled cheese! Wonderful! There are few things I love more than a good grilled cheese! We can’t get squash with blossoms attached here in Saudi Arabia, unfortunately, BUT I’ve started my own veggie garden and squash is one of the starts. Fingers crossed before too long I’ll be able to make this dish. 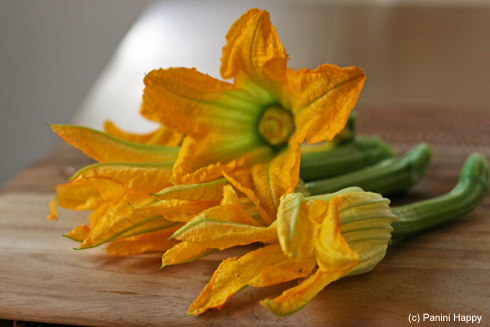 I’ve never had squash blossoms, but this would be an amazing place to start! Fabulous sandwich, Kathy! 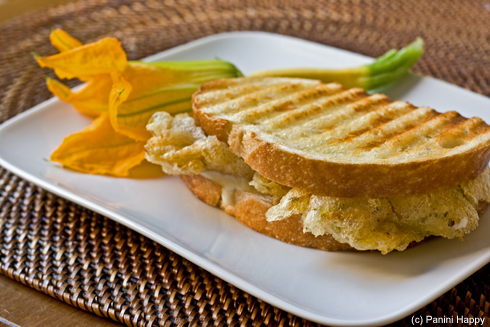 What kind of bread was used for the Squash Blossom Grilled Cheese? I used sourdough bread in the recipe. Next post: Cheese…On the Grill!